Everybody is suddenly talking about the inverted yield curve. They’re right to do so, too, but alarm bells may be premature. Inversion is a historically reliable but early recession indicator. The yield curve isn’t saying recession is imminent, even if it were fully inverted, which it is not. What we see now is really more of a flattened yield curve, with a smaller but still positive spread between short-term and long-term interest rates. That’s not normal, but it’s also not a recession guarantee. However, when we combine this with assorted other events, it adds to the concerns. I’ve been writing in this letter about negative yield curve since 2000, when the inverted yield curve said there was a recession in our future and I called a bear market in equities. Ditto for 2006, though that time the yield curve inverted long before the stock market turned. Today, we’ll look at what the yield curve is really telling us. Before we go on, let me give you a special invitation. Next week we’re opening up Alpha Society membership for a very limited time. If you don’t know, the Alpha Society gives you the best, most exclusive access to me and all our Mauldin Economics research. For one low price, you get lifetime subscriptions to all our premium services, plus some very attractive additional benefits. Now let’s dive into the Great Flattening Yield Curve and what it really means. In July 2017 I wrote a letter called Happiness Is a Normal Yield Curve and now it seems like about 10 years ago. The Fed was still in tightening mode at that point and short-term rates were rising faster than long-term rates, producing a flatter but not inverted yield curve. Here is the latest view, via GuruFocus. The light gray line is the yield curve two years ago, the medium gray is one year ago, and the blue is now. You can see the curve went from very steep to much less so in this period. That is what we mean by “flattening.” It isn’t fully flat yet, but is moving in that direction. Notice also in the blue line, the area between 3Y and 5Y actually angles slightly downward. That is the “inversion” the media is reporting so breathlessly. It is really more of a bump, if that. As I write, the 3Y is actually 2.84% and the 5Y is 2.83%. So the mainstream media, business media, and writers are getting all breathless about 0.01% on just one part of the curve. Which is kind of, sort of important to watch but it doesn’t really mean anything in terms of the economy, at least yet. That said, it is still remarkable that 1-year Treasury and 5-year Treasury securities, and everything in between, all have almost exactly the same yields. You don’t see any such plateau in the 2016 or 2017 curves. For the record, here’s a chart of interest rates for the last two weeks directly from the US Treasury. What you can notice is the fact that short-term rates are rising and long-term rates are falling. This is what you would see ahead of a full inversion but the process can go on for a long time. Yields are supposed to reflect risk, and risk grows with time. The chance something bad will happen in the next five years is higher than the chance something equally bad will happen in the next year. Lenders, i.e. 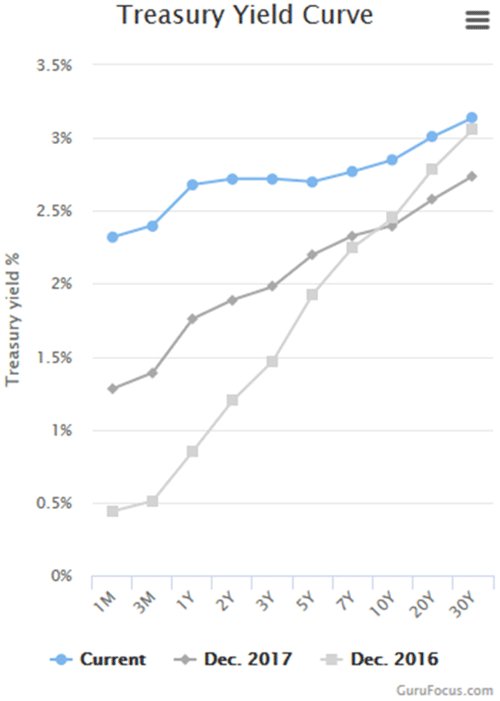 bond investors, should demand a higher yield as compensation for that higher risk. Presently they aren’t. I show all this to clarify a point the media is obscuring: The full yield curve is not inverted. Only a small part of it is inverted, which is unusual but no reason to panic. It is nowhere near the kind of inversion that might signal recession. And even if it were, it wouldn’t mean recession is right around the corner. I’ve been using an analogy in my speeches recently that has received excellent feedback, so I want to share it with you. Many media sources and writers seem to indicate that an inverted yield curve causes recession. That is simply not true. Think of an inverted yield curve as a fever. When your body gets a fever, the fever is not the cause of the sickness. It just says something’s wrong with your body. You have the flu, appendicitis, or some other ailment. The fever indicates you are sick but not necessarily what the sickness is. And typically, the higher the fever the more serious the condition. It is the same with the yield curve. 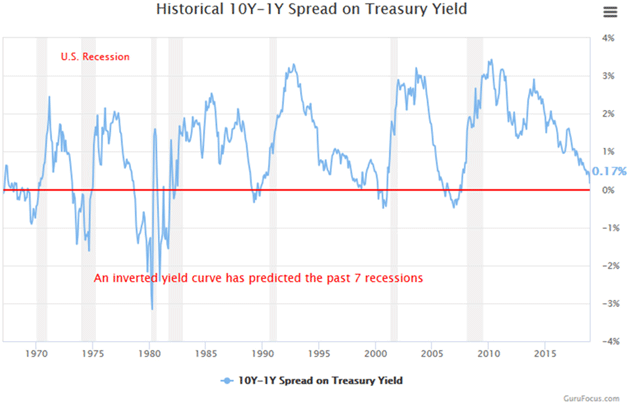 The more inverted the yield curve is and the longer it stays that way, the more confident we are that something is economically wrong that may show up as a recession sometime in the future. More on that timing below. In a true inversion we would see the entire curve angled down from left to right. That last happened in 2005. Were we in recession then? No, not at all. The economy was booming. In fact, the yield curve stayed inverted until mid-2007. Some of us saw cracks forming in the economy, and said so at the time. But the actual recession would not begin until December 2007. That’s a longstanding pattern. The inverted yield curve has been a pretty reliable recession indicator but it shows up far in advance—months or even more than a year. We might better think of it as signaling the cycle’s “blowout” stage. People see the inversion, observe nothing bad happening, then throw caution to the wind. Another way to illustrate this is with a yield spread, i.e., a long-term yield minus a short-term yield. You can graph the difference and it goes below zero when the short-term yield is higher, meaning an inversion exists between those two points on the yield curve. This chart shows the spread between 10-year and one-year Treasury yields. The gray vertical bars are recessions. You can see how the spread dropped below the 0% line right before each one, and is now close to that point again. But notice also how long it stayed inverted before the last recession, and how far in advance. The 10Y-1Y spread dropped below zero in January 2006, came back above for a little bit, stayed there and was moving higher when the recession finally began. The same happened in 2000. In fact, by the time actual recession arrives the yield curve can resume a normal pattern. Here’s a slightly different chart from FRED (the St. Louis Federal Reserve all things economic database), using the 10Y-2Y yields. This is the “tens and twos” spread traders usually watch. We again see the same pattern. You can vary the parameters but the broad principle holds pretty well. Yield curve inversions precede recessions by anywhere from a few months up to two years. This awareness that an inverted yield curve signals recession isn’t new, nor did it appear from thin air. My first economic mentor, Dr. Gary North, was teaching me about inverted yield curves in the early 1980s. To my knowledge, there was no real research, just anecdotal observational analysis, but it still held. Then my friend and economist Campbell Harvey, now at Duke University, first proved its forecasting accuracy in his 1986 University of Chicago doctoral dissertation. Others quickly confirmed and expanded on his conclusions. 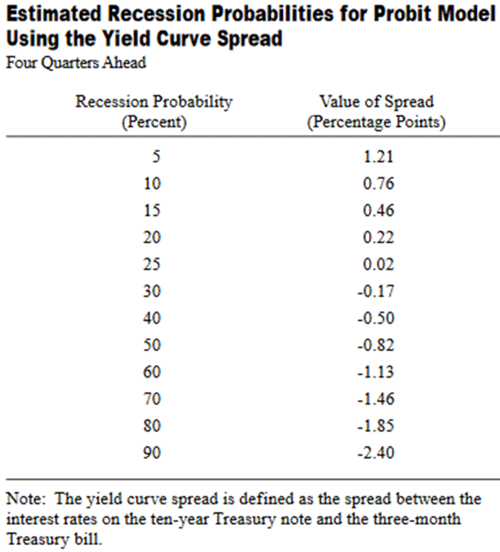 In 1996, New York Fed economists Arturo Estrella and Frederic S. Mishkin authored a paper comparing the yield curve to 19 other indicators and, importantly, finding a connection between the yield spread and recession probability. 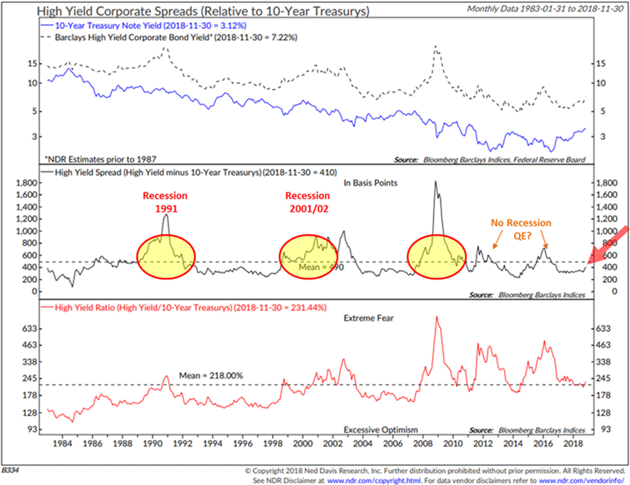 To summarize, Estrella and Mishkin found the yield curve is most predictive of recession a year or so ahead of time. In fact, they concluded an inverted yield curve was the only useful predictor of recessions. 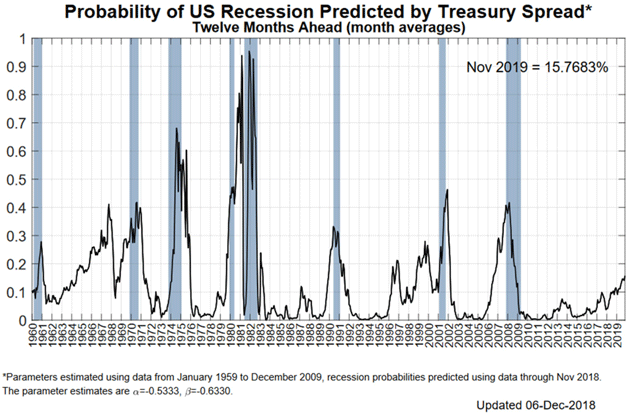 Examining all the data from 1960-1995, they calculated the probability a recession would occur four quarters ahead, based on the spread between three-month and 10-year Treasury securities. They summarized it in this table. Again, the yield curve is inverted when the spread is negative. Estrella and Mishkin found recession probability begins rising as the spread drops toward and then below zero. But notice how long it takes. Even when the curve mildly inverts with the spread at -0.17%, the odds of a recession in the next year are still only 30%. But from a practical standpoint, by the time their model shows a 30 or 40% probability of recession, there has always been a recession following that point. Your next question, of course, is where are we now. The 3M/10Y spread is about 0.48%. The table suggests this is consistent with about a 15% recession probability four quarters from now. Not so bad, if you are a bull. It means odds are good we’ll get through 2019 without recession. Maybe longer, if the Fed pauses tightening next year and long-term yields stay where they are. We are not out of the woods, though. We may just be entering them. Here is the 3M/10Y spread, the one Estrella and Mishkin used in their study, since the last recession ended. The spread peaked almost coincident with the last recession’s end (the gray area at left) and has been dropping ever since. The ride down was smoother since mid-2017. Another two years like the last two will put the spread around -1.0%, meaning a recession is likely in 2020. The decline could also steepen and bring recession sooner. After they wrote this paper, Mishkin went on to be a Fed Governor from 2006-2008 and is now at Columbia University. Estrella is still at the New York Fed and has been keeping these numbers updated. Here’s his latest chart showing recession probability. As you see in the lower right of the chart, recession probability has been rising and is now around 15%, consistent with their earlier work. It is not rising as quickly as it did ahead of the last recession. First, he told me he had done another study in 1998 comparing even more predictors. The latest study involved 30 potential predictors of a recession. The conclusion of that study was that the 90-day average of the yield curve was still the most reliable predictor of the 30 they studied, so score one for taking this current situation more seriously. But he would not go so far as to say that he personally saw a recession coming. I would like to consign that reluctance to the fact that he was still at the Fed. Later in 2006, I was on my friend Larry Kudlow’s CNBC show with Nouriel Roubini and John Rutledge. Larry and John were both adamant the bull market was in no way over and no recession was on the horizon. Nouriel and I saw it different. Oddly, we were all correct. How can that be, you ask? A bear market began about six months after the show and recession six months later. But the stock market rose almost 20% after that show as well, so if you had exited the stock market, you would’ve missed a 20% rise (but still avoided a 50% bear market). Sidebar: That has now happened to me twice. I’ve called recessions early and missed some opportunities. That is one of the reasons that I now use money managers with quantitative timing models. At the beginning of 2017, the four managers I use were heavily invested in equities. This year they have slowly moved into cash and are now as a group holding a significant portion (over 70%) of cash and cash equivalents. But then again, their models could become bullish. I have come to the point that I simply trust their models. For me, it feels a lot better than trying to make a prediction based upon my own analysis. I haven’t found a way to predict the future accurately, and certainly not with anything close to precision timing. And so while I can watch the yield curve and begin to get an idea of when there might be a recession in our future, applying that in a portfolio is difficult at best. So pulling all this together, the flattening yield curve is a fair bit away from signaling a recession in the next year. That could change but it’s where we are now. But it is certainly something to watch. On the other hand, history never repeats itself quite so perfectly. Other things are different—all the European Threats I described last week, or the prospect of wider trade war as President Trump tries to make China change its ways. I would not conclude from the yield curve that recession is either imminent or impossible. It says what I already knew: A recession will strike at some point, but we probably have a little time. I suggest using that time to prepare. As I’ve been saying for the last few months, you should prepare to exit positions that may become illiquid, think of ways to hedge, and generally get ready for a volatile 2019. Think of cash as an option on the future. The high-yield bond market is also illustrative. Here is a chart from a webinar I just did with Steve Blumenthal. Steve has been timing high-yield bond markets since 1992. I was actually timing high-yield bond markets for clients in the early 2000s when Steve and I met and I realized his system was better than mine. He’s had three incredible runs since then in which he exited high-yield bonds and then his quantitative system said to get back in. He will tell you that he was extremely nervous every time but he did what the model told him to do. Extraordinary gains followed because as rates fell the bonds delivered both high yields and capital gains. Steve feels a similar opportunity is coming. But you’ll need some cash to participate when that time arrives. I think we’ll see a host of opportunities at the bottom of the next recession. Seizing them will take an iron stomach, but it’s at the bottom of the markets, when everybody else is panicking, that you find real life-changing opportunities. While cash may seem unattractive today, it is really an option on future opportunities. You may be reading this letter while Shane and I are on a plane on our way to cold Cleveland and the Cleveland Clinic to spend two days in their executive wellness program. The first week of January I will fly to San Francisco for the Biotech Showcase and then a Juvenescence seminar on antiaging and even age reversal. There is an amazing amount going on in this area. Then the third week of January Shane and I will be at the Tiger 21 conference in Boca Raton. If you are at the conference, drop me a note so that we can touch base. We are very close to opening registration for my Strategic Investment Conference which will be held in Dallas next May 13-16. This will be the 16th annual conference. I can unequivocally say that it will be the best conference we’ve ever done. I am extraordinarily pleased and proud of the lineup that we have already assembled and we will confirm more soon. You won’t want to miss this conference. There is nothing like being in the room to discuss the presentations with like-minded people. It is a completely different experience than listing to the audiotapes or reading the transcripts. The best testimony I can give you is that well more than half those present will be repeat attendees. There is a reason they keep coming back. Watch your email for the invitation, as the reduced early bird rate will not last long. And I would not be surprised if the conference sells out again this year. You don’t want to miss it. Like most important politicians, Emmanuel Macron is a polarising figure. So Macron-haters have seized upon the unrest in Paris to argue that the French president stands revealed as a massively flawed leader — remote, arrogant and pushing an outdated neoliberal agenda. By contrast, Macron-lovers insist that their hero can ride out his current troubles and still be a transformative president. Neither verdict is convincing. Mr Macron is indeed an impressive figure. He has correctly identified the need for structural reforms of the French economy and has bravely made the case for internationalism. But the bleak truth is that the president is gravely wounded by the gilets jaunes protests, the accompanying violence — and the panic-driven U-turns in government policy. Indeed the events of the past week are likely to be a turning point that will neuter the Macron presidency and prevent it delivering on its early promise. To understand why that is the case, you need to examine three key aspects of the Macron agenda: internal economic reform, deeper European integration and global governance. These three ideas are interdependent. The idea was that if Mr Macron could demonstrate his ability to change France, he would convince Germany to accept decisive steps towards a genuine European economic government. A reformed, strengthened EU could then push back against the resurgent forces of nationalism, visible from Washington to Beijing. If Mr Macron’s domestic agenda runs into trouble, his international agenda is likely to fail as well. That is precisely what is happening. The Macron loyalists are right to point out that their man has already notched up real achievements. He has pushed through changes to the rigid French labour markets, which should make it easier to create jobs. And he won an important victory against the powerful railway unions. But the sense of momentum created by these reforms has now been destroyed. The Macron government has had to reverse its increase in fuel taxes. And the president is likely to promise further sweeteners to appease the demonstrators. More significant, important reforms that were planned for the future — to the pension and health systems — now look much less likely to happen. As a result, efforts to reduce the size of the French state, restore order to government finances and reinvigorate economic growth look much less achievable. Instead, Mr Macron looks likely to go down as just the latest French president to abandon reforms in the face of street protests. The essential French contradiction — the demand for lower taxes and better public services — will remain unresolved. Indeed, things could get a lot worse. Protests and street violence have the potential to rumble on for months, creating a sense of permanent crisis. Even if France’s cities calm down quickly, the risk that Mr Macron could be succeeded by a president of the far-right or far-left has clearly increased. Faced with these developments in France, Germany is highly unlikely to commit to the kind of ambitious EU reforms outlined by Mr Macron. A decade of economic crises in southern Europe has left German politicians highly suspicious of anything that looks like a “transfer union” that might see German taxpayers permanently subsidising welfare in less solvent EU nations. A dynamic and successful Macron-led France might have overcome this German scepticism (which is shared by the Netherlands and much of northern Europe) — and helped propel the eurozone towards the “economic government” that the French are arguing for. But events on the streets of Paris will confirm German prejudices that the French state is unreformable. In truth, even before the gilets jaunes uprising, Franco-German relations were deteriorating, with the German government increasingly irritated by what it regarded as empty grandstanding by Mr Macron; the French government is dismayed by what it regards as a lack of vision and generosity in Berlin. All of this matters globally. Mr Macron has moved boldly to position himself as the “anti-Trump” — and the world’s leading spokesman for international co-operation. He has vocally defended the Paris climate accord, which the US has abandoned. Indeed, his commitment to action on climate change lay behind the ill-fated fuel tax. But Mr Trump is fortunate to be in the White House, not the Elysée. Leading France looks increasingly like an impossible job. Successive presidents, with different styles, have ended up despised by the public. Nicolas Sarkozy was denounced as too “bling”; François Hollande was denounced as too ordinary; now Mr Macron is too haughty. If Mr Macron had been able to break this dismal cycle, his international credibility would have soared. He could have emerged as the global champion of liberal values — such a champion is sorely needed. Now, however, it seems highly unlikely that Mr Macron can save the world. He will be lucky if he can save his own presidency. A few years ago the Swiss National Bank (SNB) – which traditionally held “monetary assets” like government bonds, cash and gold to back up the Swiss franc — decided to branch out into common stocks. This was a departure, but for a while a brilliant one. 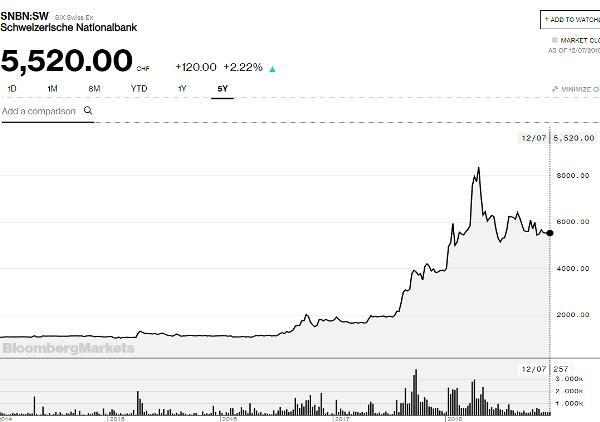 The SNB loaded up on Big Tech like Apple, Amazon and Microsoft, and rode them to massive profits, which enriched both the Swiss people and the SNB’s stockholders (in another departure, it’s a publicly traded company as well as a central bank). But live by the sword, die by the sword. Turning your central bank into the world’s biggest hedge fund means outsized profits in good times, but potentially serious losses if those aggressive bets go wrong. The following table shows the SNB’s seven biggest stock positions. Note that 1) they’re all US based multinationals – not a single Swiss stock – and 2) they’re all way up over the past few years but way down over the past two months. Total loss from these positions since September 30: nearly $2 billion. SNB’s stock price, after quadrupling during the FANG stock bubble, has given back some of that gain. Now, why should anyone other than the Swiss and the SNB’s stockholders care whether this central bank/hedge fund wins or loses? Because of the concept of “moneyness” and what it implies for the future. The quick version of the story is that investors generally hold a variety of assets, some of which are money and some of which are not. Money is seen as risk-free or nearly so, and makes up the part of a portfolio that is expected to hold its value. Once that risk-free core is secured, other assets that fluctuate in value are added to generate excess returns. But – here’s where it gets interesting — at different points in the credit cycle, different things are perceived to have “moneyness.” In stressful times the range of assets perceived as risk-free shrinks down to cash, gold and major-government sovereign debt. In more optimistic times – like the later stages of a credit bubble – other things come to be perceived as having moneyness because they’ve been going up for so long that it’s hard to conceive of them behaving any other way. This sense that Amazon and its peers can never fall, and if they do that’s just an opportunity to buy the dip, had become widespread lately, to the point that most classes of investors had bought in. Pension funds, desperate to meet their unrealistic return targets, added equity and emerging market exposure. Hedge funds whose old models stopped working in the Everything Bubble were reduced to trend following, which meant loading up on FANG stocks because they were going up. Even retirees who couldn’t live on sub-1% bank CD rates moved into growth stocks, junk bonds and emerging market debt. All had the sense that these previously-risky asset classes had, by virtue of their awesome price charts, achieved moneyness and could therefore be trusted. Throughout this Bubble period, I have referred to the “Moneyness of Risk Assets.” A “run” on perceived money-like Credit instruments sparked the collapse of the mortgage finance Bubble. Runs unfold when holders of perceived safe and liquid instruments suddenly recognize risk is much greater than previously appreciated. Past crises have typically originated in the money markets. But never have central bank and government policies so fostered the perception of safety and liquidity (“moneyness”) for risk assets – equities and corporate Credit, in particular. I would argue the proliferation and massive growth of index fund products poses a major risk to financial stability. And when it comes to policy-induced distortions, already extraordinary risks to financial stability are only compounded by the proliferation and growth of derivative trading strategies, both retail and institutional. In other words, pretty much everything the financial world is doing these days relies on a false sense of security fostered by “innovations” (ZIRP, QE, ETFs) that hide the true risks of financial assets. And people are starting to figure this out. The ultimate end game is the realization by investors that most major asset classes – including today’s fiat currencies — lack moneyness. The resulting stampede out of the dollar, euro and yen and into real assets will be one for the history books. We are, once again, experiencing one of the greatest housing booms in United States history. How long this will last and where it is heading next are impossible to know now. But it is time to take notice: My data shows that this is the United States’ third biggest housing boom in the modern era. Since February 2012, when the price declines associated with the last financial crisis ended, prices for existing homes in the United States have been rising steadily and enormously. According to the S&P/CoreLogic/Case-Shiller National Home Price Index (which I helped to create) as of September, the prices were 53 percent higher than they were at the bottom of the market in 2012. That means, on average, a house that sold for, say, $200,000 in 2012 would bring over $300,000 in September. Even after factoring in Consumer Price Index inflation, real existing home prices were up almost 40 percent during that period. That is a substantial increase in less than seven years. In fact, based on my data, it amounts to the third strongest national boom in real terms since the Consumer Price Index began in 1913, behind only the explosive run-up in prices that led to the great financial crisis of a decade ago, and one connected with World War II and the great postwar Baby Boom. The No. 1 boom occurred from February 1997 to October 2006, when real prices of existing United States homes rose 74 percent. This was a period of intense speculative enthusiasm — for houses and for financial instruments based on mortgages as investments — and it was also a time of great regulatory complacency. The term “flipping houses” became popular then. People exploited the boom by buying homes and selling them only months later at a huge profit. That boom ended disastrously. Soaring valuations collapsed with a 35 percent drop in real prices for existing homes, ushering in the financial crisis that enveloped the world in 2008 and 2009. The second greatest boom, from 1942 to 1947, had more benign consequences. Over this five-year interval, real prices of existing homes rose 60 percent. Booms and busts are rooted in popular narratives with complex social-psychological roots. This boom centered on a war-induced housing shortage, an enormous increase in the number of new babies and families who would need housing after the war, and the 1944 G.I. Bill, which subsidized home-buying by veterans. Home prices did not fall significantly after this boom ended. 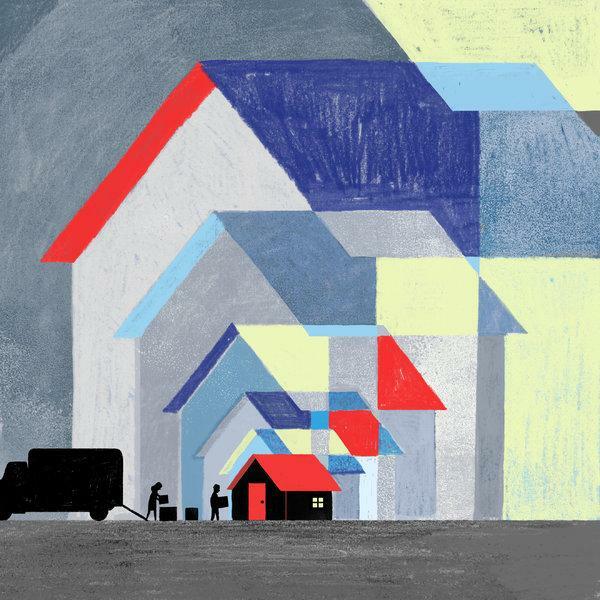 Today, signs of weakness in the housing market are being taken by some as a signal that the prices of single-family homes may fall soon, as they did sharply after 2006. The leading indicators, which include building permits and sales of both existing and new homes, have all been declining in recent months. But with few examples of extreme booms, we cannot be sure what such indicators mean for the current market. Low interest rates — imposed by the Federal Reserve and other central banks in reaction to the financial crisis — are the most popular culprit in the current boom. There is some apparent merit to this view, since these three biggest nationwide housing booms all included very low interest rates. But the market reaction to interest rates is hardly immediate or predictable. The housing market does not react as directly as you might expect to interest rate movements. Over the nearly seven years of the current boom, from February 2012 to the present, all major domestic interest rates have increased, not decreased. So, while interest rates have been low, they have moved the wrong way, yet the boom has continued. Another explanation is simple economic growth. But, as a matter of history, prices of existing homes — as opposed to the supply of newly built homes — have generally not responded to economic growth. There was only a 20 percent increase in real prices of existing homes in the 50 years from 1950 to 2000 despite a sixfold increase in real G.D.P. The simplest narrative being given for the current boom is just that the 2008-2009 financial crisis and the so-called Great Recession are over and home prices are returning to normal. But that explanation does not cut it either. In September they were 11 percent higher than at the 2006 peak in nominal terms, and almost as high in real terms. This is not a return to normal, but a market that appears to be rising to a record. It is difficult to assess the contribution of President Trump to the current boom. It is certainly less obvious than the role of President George W. Bush in the 1997-2006 boom. Mr. Bush extolled the benefits of “the ownership society” and in 2003 he signed the American Dream Downpayment Act, which subsidized home purchases. In his 2004 re-election bid he boldly asserted: “We want more people owning their own home.” This seems to have contributed to an atmosphere of high expectations for home price increases. The Trump administration’s attitude toward housing is less clear. President Trump’s slogan “Make America Great Again” has overtones of the “American dream.” But provisions of his Tax Reform and Jobs Act of 2017 were unfriendly to homeowners. Even without major further interest rate increases, there would seem to be a limit on how much the prices of existing homes can increase. After all, people must struggle to cover a range of living expenses, and builders are supplying fresh new offerings to compete with the existing houses on the market. It can’t go on forever, of course. But when it will end isn’t knowable. The data can’t tell us when prices will level off, or whether they will plunge catastrophically. All we do know is that prices have been roaring higher at a speed rarely seen in American history. Robert J. Shiller is Sterling Professor of Economics at Yale. There is no shortage of precedents for the approach to the escalating trade dispute taken by Donald Trump and Xi Jinping. But if the US economy shows signs of falling into recession, Trump will need to blame someone – and in this case, we can be relatively certain about who that will be. 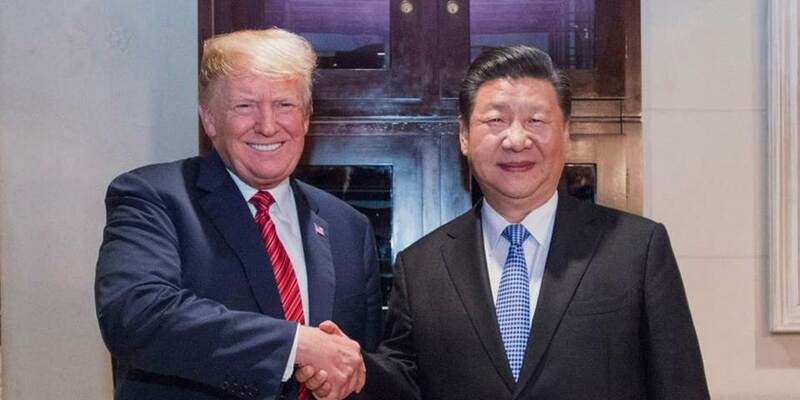 BEIJING – On December 1 in Buenos Aires, US President Donald Trump and his Chinese counterpart, Xi Jinping, agreed on a 90-day moratorium on increases in import tariffs to provide a window for negotiations. Unfortunately, this approach to mediation does not always succeed, and investors were not impressed – as was evident in the 800-point fall in the Dow Jones Industrial Average on December 4. And if markets were skeptical then, they will be even more skeptical now, with the arrest of Huawei Chief Financial Officer Meng Wanzhou for violating US sanctions on Iran. The two presidents’ approach to relieving trade tensions does have ample precedent, but such episodes provide little grounds for hope. In February 1930, the League of Nations convened an international conference in Geneva to address the problem of proliferating protectionism that “obstructed the development of large-scale production and impeded European recovery” and was deployed more generally as a “weapon of economic warfare.” Thirty countries sent delegations. The United States, though not a member of the League, sent Edward C. Wilson, the first secretary at the US Embassy in Paris. In advance of the negotiation, the Economic Committee of the League drafted a convention for a two-year customs truce. But the delegates accepted neither this draft convention nor a scaled-down version submitted subsequently by the French. New states with ambitious industrialization plans were not prepared to abandon them (shades of “Made in China 2025”). Countries running chronic deficits were loath to sign onto the agreement absent a commitment by others to take more of their exports (an objection that will resonate with Trump). Nothing of substance was agreed. When the US, responding to domestic political pressures, adopted the Smoot-Hawley Tariff four months later, angry European governments responded in kind. The rest, as they say, is history. Planning for Smoot-Hawley had been underway well before the Great Depression. But the onset of the Great Depression intensified the pressure to do something – anything – that might alleviate the collapse of domestic spending. Given preceding discussions, the most plausible such something was the tariff. Today, with the US housing market cooling and financial conditions tightening, a US recession is not out of the question. Together with a decline in the stock market, that recession would ratchet up the pressure on Trump to look like he was doing something – anything – to prop up the economy. Most likely, that something would come at China’s expense. Part of the problem in 1930 was that countries came to the Geneva conference with very different views of what they had signed up for, which appears to be the case again today. Whereas the Trump administration expects rapid progress in reducing the bilateral trade deficit, Chinese state media refers to the desirability of a “gradual” reduction. Whereas the White House press release specifies a 90-day window for negotiations, China mentioned no specific time frame. Similarly, whereas the official White House statement asserts that China will purchase “very substantial” farm, energy, and industrial exports from the US, China’s statement says only that it will import more US goods. But that will of course occur in any case, without any policy action, assuming that the Chinese economy continues to expand, as is all but certain, given recent fiscal and monetary support. Most troubling are differences related to intellectual property. According to the US statement, China will immediately negotiate on forced technology transfer and IP protection. By contrast, the Chinese statement says only that the two countries will work together to reach a consensus on trade issues. Reform of the IP regime is a valid US concern. Indeed, it is the most important issue. But strengthening IP protections will require a fundamental change in China’s economic model. There is zero chance of this happening in 90 days. How, then, might the negotiation play out? One scenario is that the Chinese buy some additional American soybeans. Trump characterizes this as a great victory. The US president having waved the white flag, the trade war comes to an end. Nothing substantial will have changed, but at least the diplomatic and commercial sniping and disruptive uncertainty will be over. Again, there is ample precedent for this, the North American Free Trade Agreement renegotiation having ended this way. Alternatively, one can imagine an outcome along the lines of Trump’s meeting with North Korean leader Kim Jong-un: China announces, or at least the Trump administration imagines that it has announced, a profound transformation of its economy. But this belief in a breakthrough is illusory. In fact, nothing of substance has changed. When Trump and his advisers wake up to this fact, tensions will spike, and the trade war will resume. Which scenario is more likely? As in 1930, the answer hinges on how US economic conditions develop. If the late-stage expansion continues, as it did during the NAFTA renegotiation, Trump may be inclined to accept cosmetic concessions, which he can characterize as the “largest, most significant, modern and balanced trade agreement in history.” But if the US economy shows signs of falling into recession, Trump will need to blame someone. And in this case, we can be relatively certain about who that will be. Barry Eichengreen is Professor of Economics at the University of California, Berkeley, and a former senior policy adviser at the International Monetary Fund. His latest book is The Populist Temptation: Economic Grievance and Political Reaction in the Modern Era.